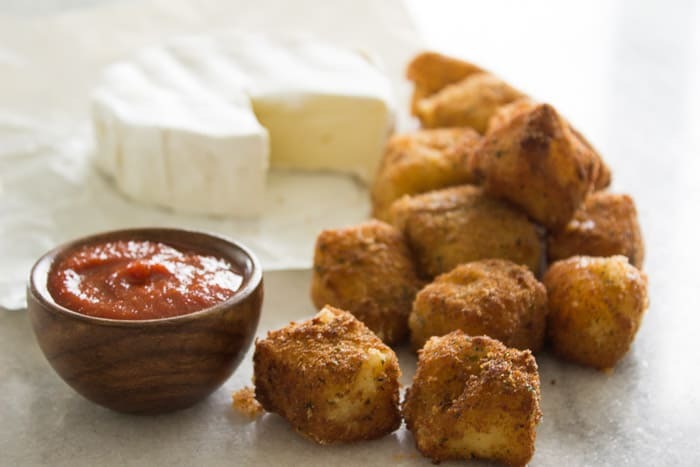 You need to drop what you are doing, get on down to the store, buy some Brie and make these amazing little fried Brie bites TODAY. Because if you love cheese as much as I do, you will take one creamy crunchy bite, swoon, and then fall into a chair with a big happy sigh. Then you’ll grab your tray of fried Brie bites, run to your room, close and lock the door so no one else gets any and…oh wait. No one does that, right? Right? These little bites of delicious-ness deserve to be shared, I guessss. 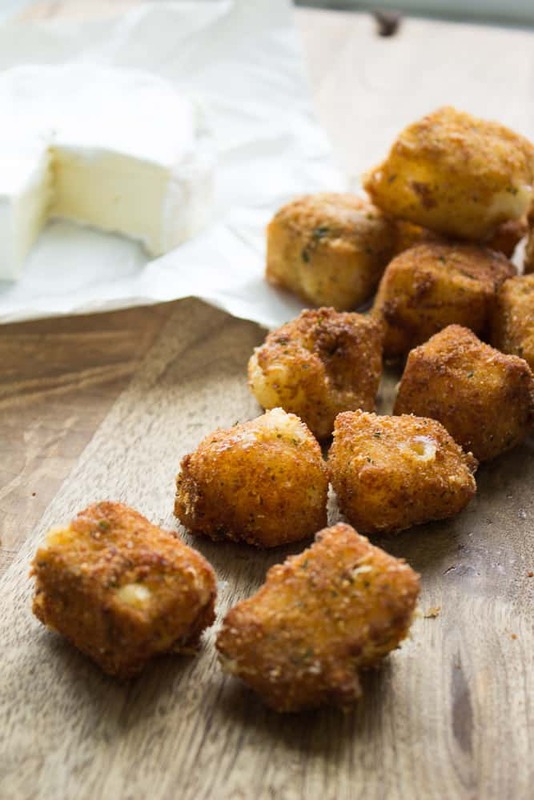 This fried Brie bites recipe is also freezer friendly. 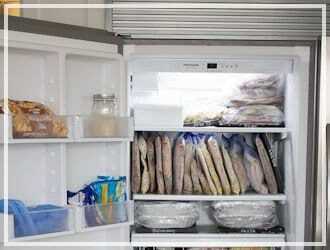 You can freeze them before they have been fried, and store them in a freezer safe bag. Then when you want to make them, you can quickly fry some up. They only take a few minutes to fry. 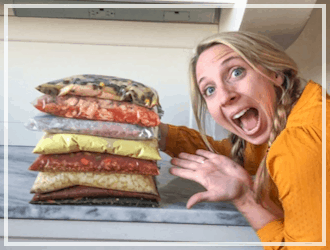 Freeze them ahead for those times when your kids all of a sudden bring home hungry friends after school…or make them ahead for a party. 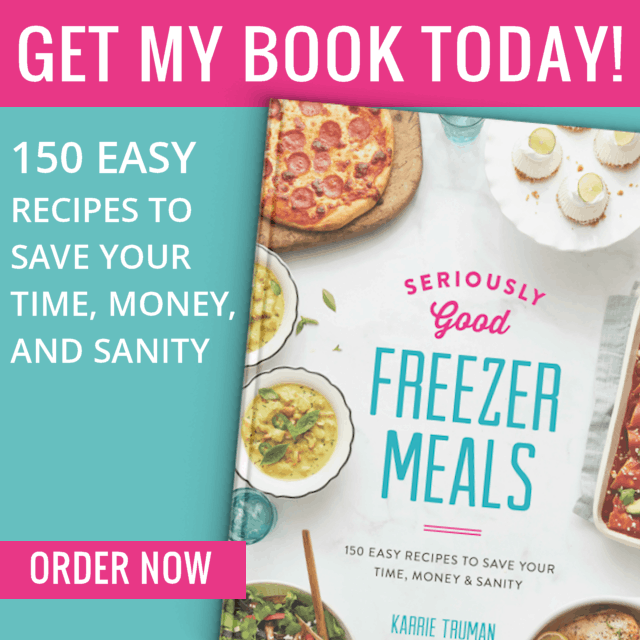 See more of my freezer meals here. 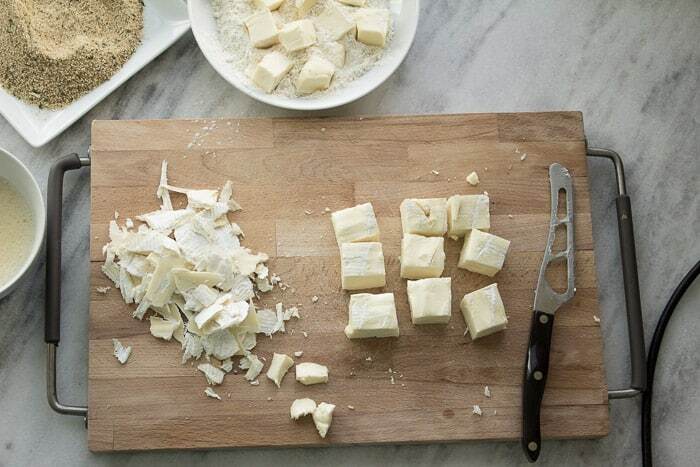 And because I have the Frigidaire Gallery® Induction Cooktop not only is frying these Brie bites fast but clean-up is a breeze too! And with having 4 kids I can use all the time I can get. Have you heard of Induction cooktops? 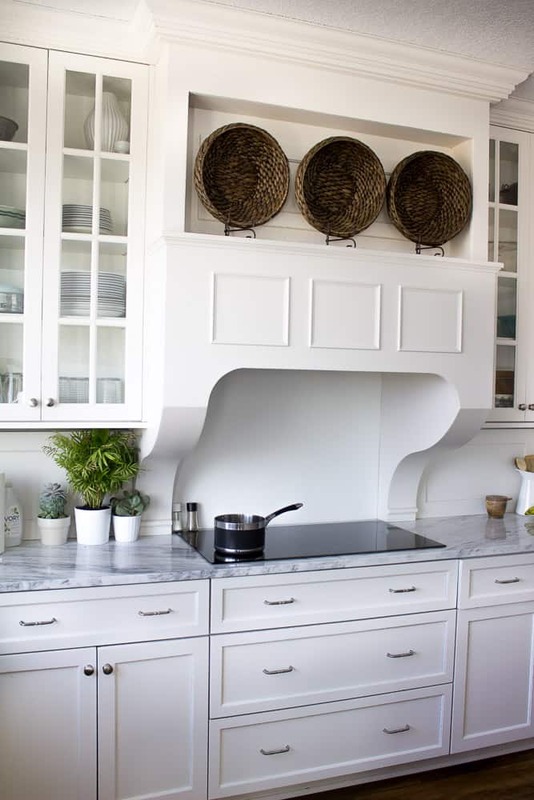 When I was looking at kitchen appliances for my new home I was honestly really sad that we didn’t have gas lines in our area so I couldn’t get a gas stove top which was my dream. Well, we had to go electric and our choices were glass top or induction. Even though I didn’t know much about induction cooktops or ever used one, I picked induction. And I am SO glad I did! 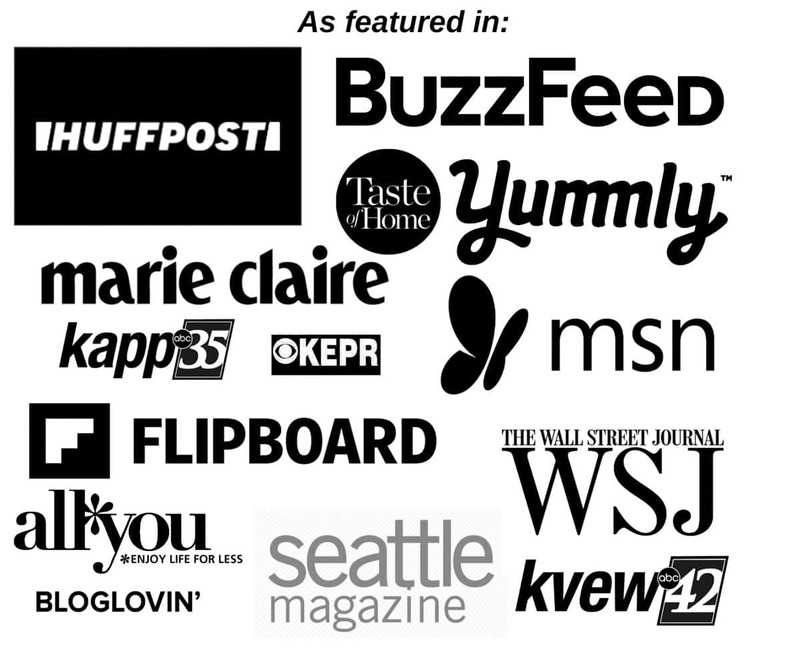 I absolutely LOVE my Frigidaire Gallery® Induction Cooktop and will never dream of gas again. EVER. 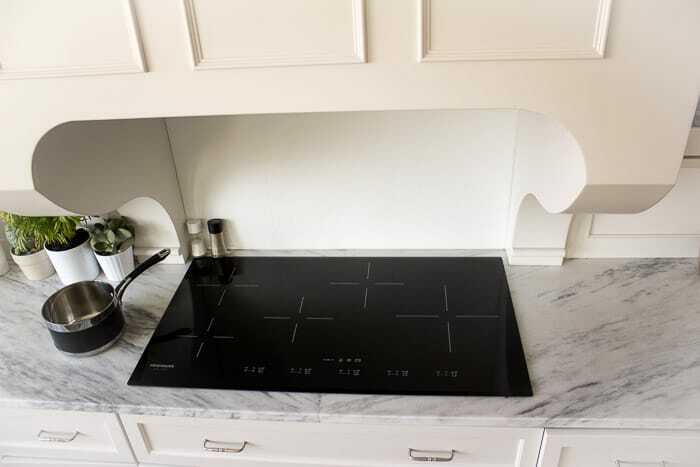 Induction works by magnetics forces so it heats the pan, not the cooktop – so spills can’t burn on. That means no crusted on burnt food when my pot boils over! Plus induction is faster than other stoves. I love to impress anyone who comes over with getting a small pot of water to boiling in less than 2 minutes! It’s super easy to clean and with the time savings I get to do more of what I love. 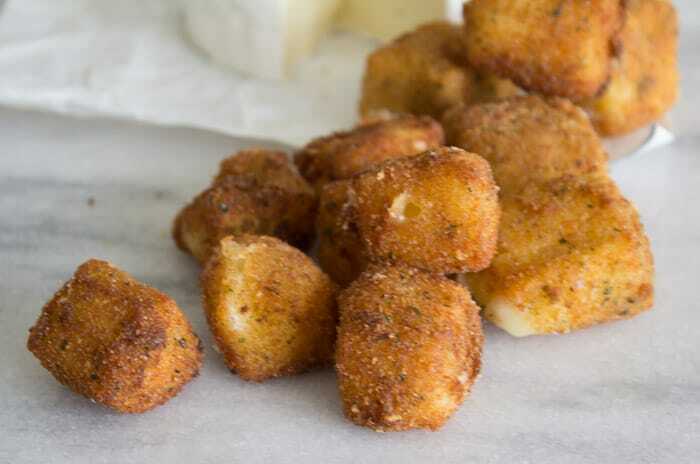 You know, things like making fried Brie bites, eating them all and thereby gaining 10 lbs. So worth it!! 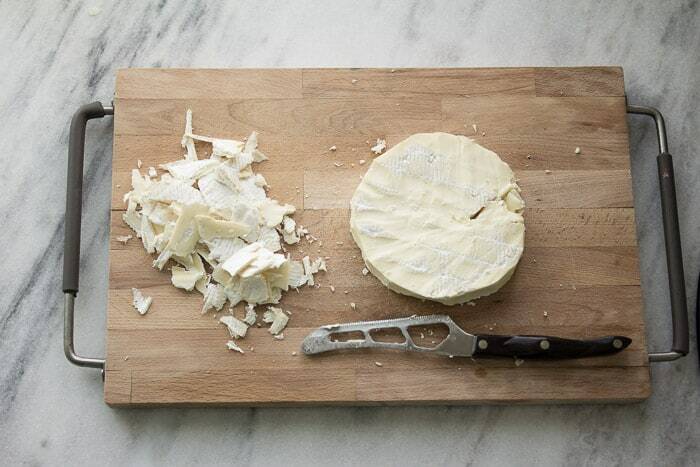 Using a serrated knife held at a 45 degree angle, scrape the rind off of the wheel of Brie. Scrape lightly so that you only remove the rind. There will be small pieces of rind left in little creases of the wheel. You can either scrape the rind out with the tip of the knife, or leave it. I like a little hint of the rinds flavor anyway. Get three bowls. In one bowl; combine the flour, salt, pepper, and garlic powder. In the second bowl; whisk together the egg and water. In the third bowl; pour in the Italian breadcrumbs. 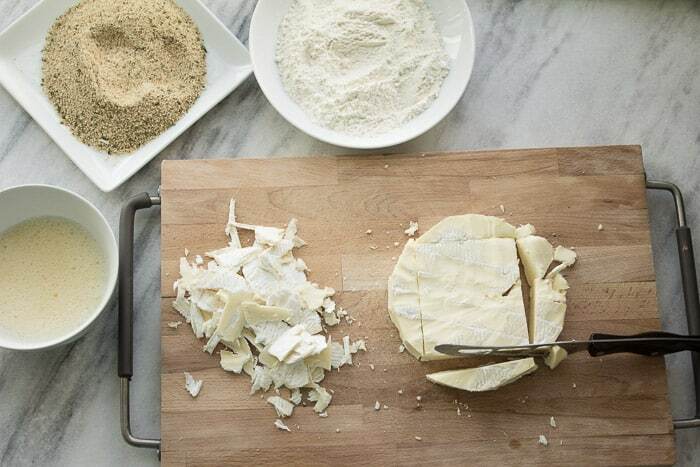 Using a nonstick knife or a cheese cutter (Brie is very soft, and can stick to a knife easily, as well as your fingers); cut the wheel of brie into 1 ½ inch cubes. You can do this by first cutting the wheel into a square. Just make sure when you square it that you cut the rounded pieces big enough to coat and fry as well. 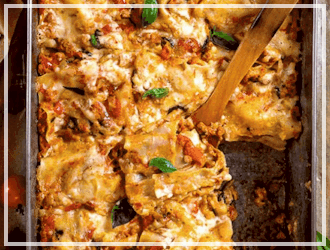 You don’t want to waste any of that yummy cheese. 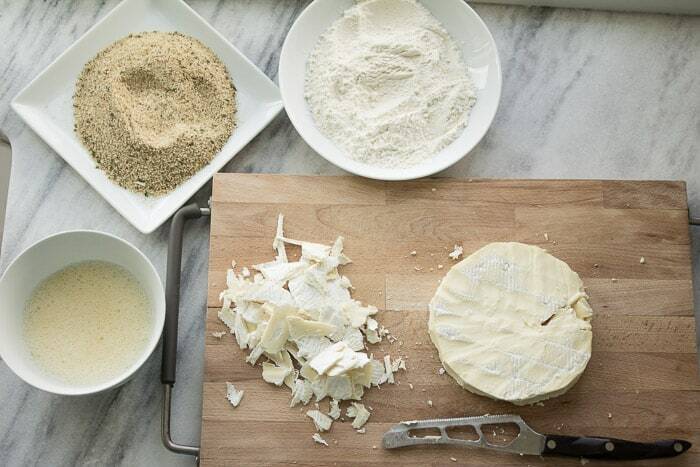 As you are cutting the cheese pieces place them in the bowl with the flour mixture. 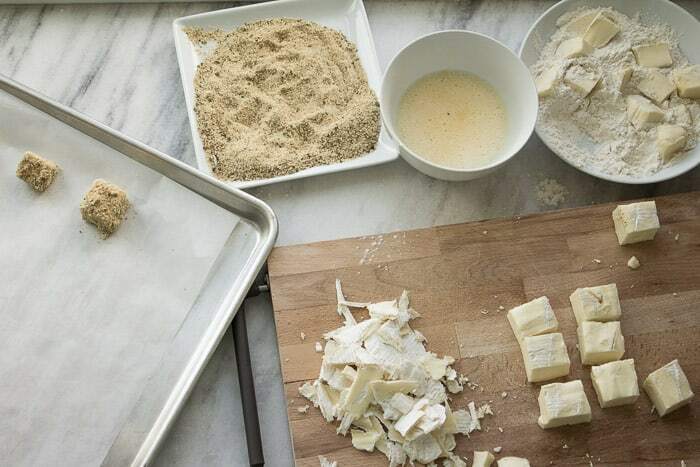 Once all pieces are cut continue to lightly coat each piece with the flour. 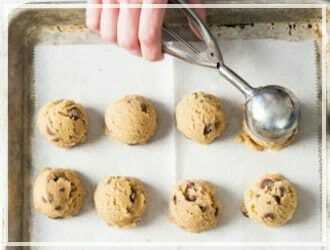 Shake off any excess flour. Working one piece of flour coated cheese at a time; dredge the cheese pieces into the egg mixture and then toss around in the breadcrumbs. Place on the parchment lined cookie sheet. Repeat with all the cheese. 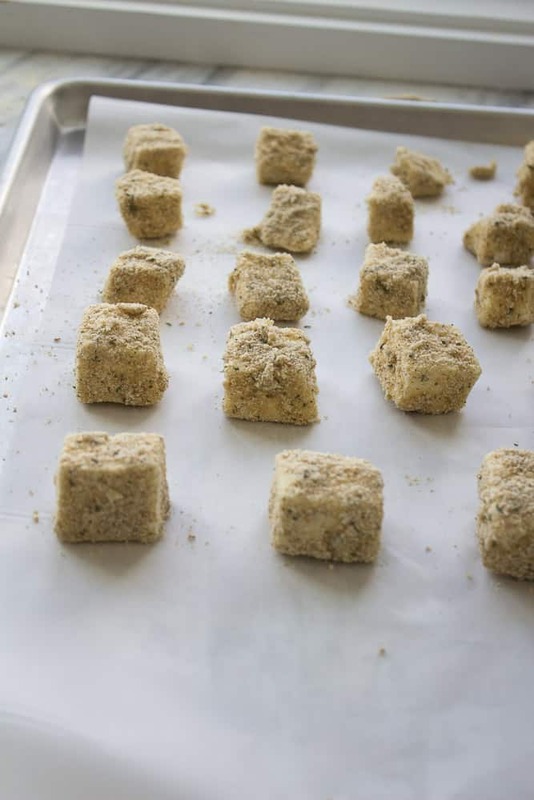 Flash freeze the sheet of cheese bites for at least 30 minutes, but 45 minutes is better if possible. 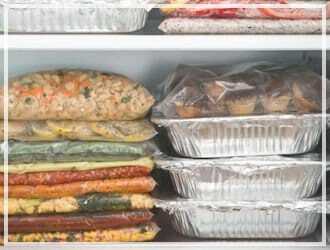 Do this whether you intend to store them in the freezer or cook them right away. You need that cheese to be frozen when it goes in the hot oil. *If you intend to freeze and store for later use; once you have done a flash freeze, pour your Brie bites into a gallon freezer bag. Seal air tight, and store in the freezer until ready to use. Fry from frozen. Heat at least two cups of oil in a 2 ½ quart saucepan to 350 degrees. Do not let your oil go too high over 350 degrees nor should you let it drop below 325 degrees. Too hot and you will end up with frozen in the middle burned on the outside. Too cool and they will take too long to brown which will result in the Brie melting too much and seeping out into the oil. Carefully, drop brie bites by the handful into the hot oil. Make sure not to crowd the pot while frying. 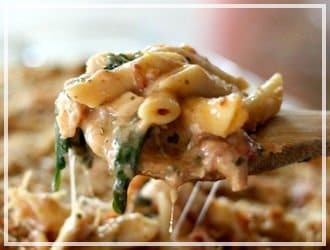 Use a slotted spoon to gently stir the Brie bites around in the oil so that they don’t stick to the bottom, and so the cook evenly. Cook for 1-2 minutes, or just until golden brown. *DO NOT EVER LEAVE BRIE BITES UNATTENDED IN HOT OIL! Not even for a second or two. 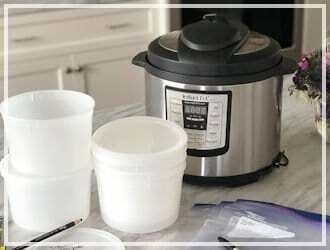 Remove with slotted spoon and drain on a paper towel covered plate. 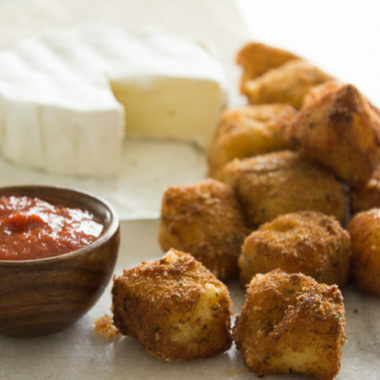 Continue this method with remaining cheese bites. 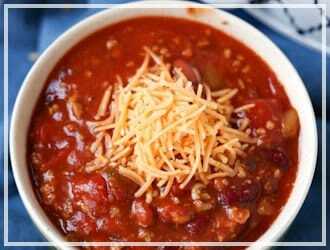 Serve hot with a candied pecan dip, or a marinara sauce. Yum! 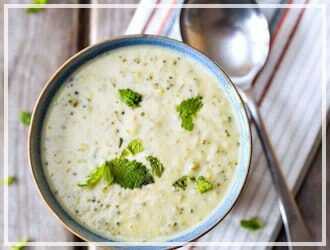 This appetizer can be made ahead and frozen! 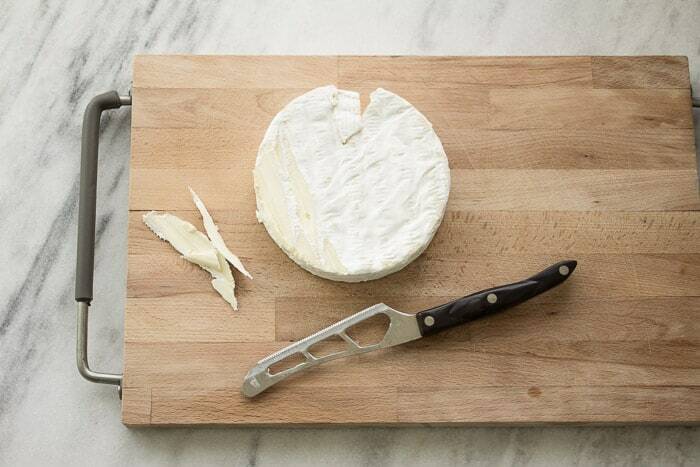 Using a nonstick knife or a cheese cutter (Brie is very soft, and can stick to a knife easily, as well as your fingers); cut the wheel of brie into 1 ½ inch cubes. You can do this by first cutting the wheel into a square. Just make sure when you square it that you cut the rounded pieces big enough to coat and fry as well. You don't want to waste any of that yummy cheese. Carefully, drop brie bites by the handful into the hot oil. Make sure not to crowd the pot while frying. Use a slotted spoon to gently stir the Brie bites around in the oil so that they don't stick to the bottom, and so the cook evenly. Cook for 1-2 minutes, or just until golden brown. Do you think these would turn out ok if I baked them at…say…400* F until they are just golden? I’ve never eaten Brie cheese before, but these look so good that I’ll probably get adventurous and try them : ) Is the taste very similar to mozza? 🙂 So sweet of you to say!